If you have been considering installing a smart home theater system, but have wondered if it is truly worth the money, time, and effort, then you have come to the right place for answers! Maddox AV knows that discerning homeowners in Anne Arundel are looking for the best quality and the best service when they shop for home theater designs. Continue reading to learn how your high-end home theater system can help you truly relax in style. Maybe you have been looking forward to sitting down with friends and family so that you could enjoy watching the entire trilogy of The Lord of the Rings. Installing a home theater system will greatly enhance the experience by immersing you in the world of middle earth. You will be able to enjoy a movie theater-like atmosphere without the hassle of talkative audience members or the occasional cell phone disturbing everyone. 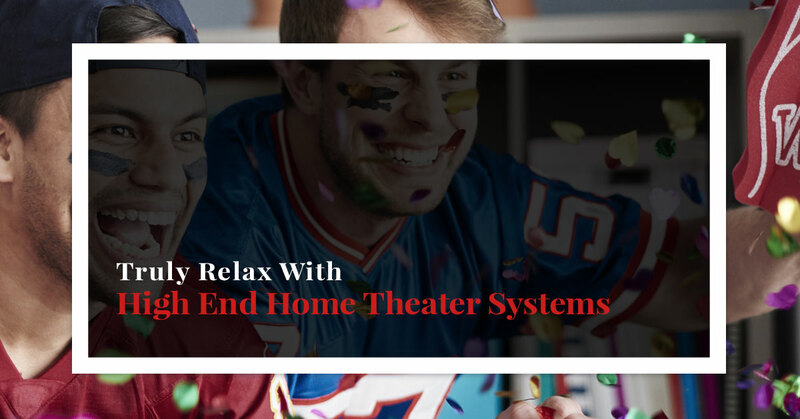 For those who enjoy sporting events, a home theater system will enable you to feel as though you were sitting on the front row, or the 50-yard line, or behind home plate. Whatever sports you enjoy watching, a home theater magnifies the experience. Hosting a Super Bowl party will be the highlight of the football season as your friends and family eagerly join you in your Anne Arundel home to see the game on a truly big screen. If you enjoy playing video games, or have kids who enjoy playing, a home theater will allow you to get “lost” in the game. The sounds and music used in video games create the ambience, or atmosphere that help you to truly enter the world of the game you are playing. Whether you are enjoying a classic game such as Mario, or a more modern game like Mortal Kombat, the sounds and songs add extra layers to the story and the overall game experience. It is hard to deny the value that is added to a home with the installation of a smart home theater system. Whether you have a cozy room, or an entire basement dedicated to your home theater, Maddox AV can work with you to design a system that is uniquely tailored to your custom specifications. One important factor to consider as you design your system is to take time to think about the best location in your home. You want to make sure that the space you choose is relatively isolated from the rest of the home so as not to disturb the primary living areas. Ideally, you would be able to dedicate a space that is 20 feet long by 13 feet wide with high ceilings, but we can work with you to make your home theater system adaptable to your space. Perhaps one of the most exciting aspects of installing a smart home theater system is that you have complete say in what you need, how you want it to function, as well as the look that fits the overall style of your home. The configuration of the equipment, the arrangement of seating, and the positioning of these items in relation to the entryway all combine to enhance your viewing experience. The lighting and acoustics are important considerations. Lighting schemes can be designed to work with your space to help combat natural light for a more authentic viewing of your favorite movie. The acoustics are the strategies that we create to assist with isolating outside noises according to your specifications. In Anne Arundel, Maddox AV is the one to trust for partnering with you in the design and installation of your high-end smart home theater system. Contact us today to learn more.